The Fern and Mossery: What Can Kids Learn from Making a Terrarium? 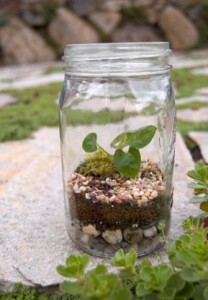 What Can Kids Learn from Making a Terrarium? As for science, a terrarium is a great way to learn about the water cycle. Water on the earth cycles through several different states from ground and surface water to clouds, to rain, and back again to the ground. It evaporates from the earth to become a vapor in the atmosphere. There, water condenses to form the water droplets that make up clouds. When they get large enough, the droplets fall back to the earth as precipitation, and the cycle begins again. In a terrarium, you get to see this process in miniature. You need only add water to it once a month because within the container, the water will evaporate, condense, and precipitate, just as it does in the earth at large.